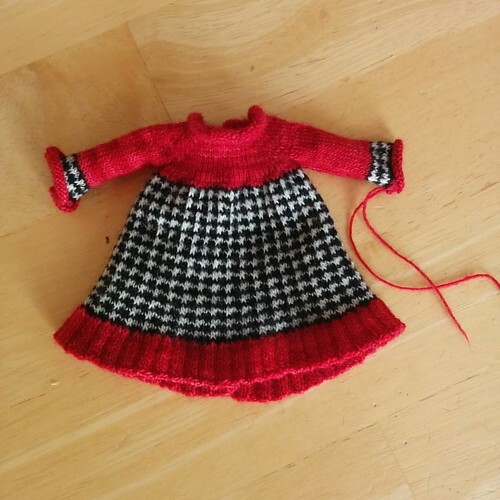 i saw a picture of a black and white herringbone knit blanket with a red ruffle and it instantly inspired me to make a dress using the same colorway. 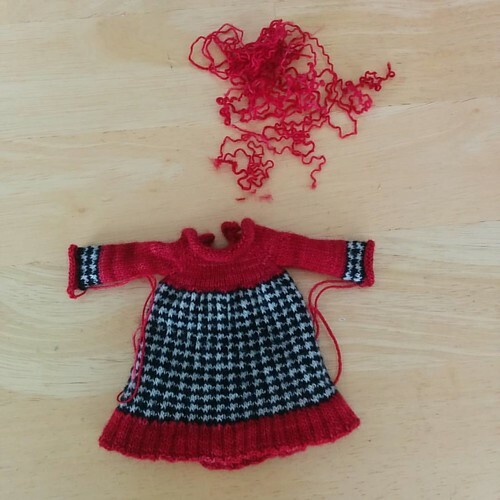 i decided to do the bodice and sleeves in solid red since the increases in the houndstooth would look kind of “smooshy” and then do the skirt the plaid and add a narrow band of paid near the cuffs to tie it together. doing the ruffle on the skirt the same as the neck/sleeve ruffles caused the skirt to curl too much so i ripped it out and did a mock pleat using a 3×2 rib instead…. much better! the bodice and sleeves are knit on 1.5mm needles. i switched to 1.75 mm when i started the houndstooth skirt, to add fullness and counteract the natural tightness of the slip stitch pattern. i had all 24 ends sewn in and the sleeve seam sewn, when i suddenly decided i didn’t like the cuffs after all.. too floofy! so i carefully cut the right one off and re-knit it in the round, since i didn’t want to even try and unstitch that whole seam without wrecking it. now i like it much better. i will be doing the same to the second sleeve. and here it is with both cuffs re-done. the pile of yarn at the top is all the bits of cut off/unravelled yarn from the original cuffs.